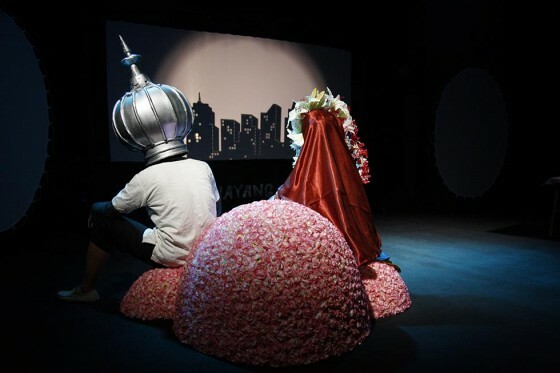 Eko Nugroho is one of Indonesia’s most provocative and original young artists whose style is a unique mix of Indonesia’s rich traditions and popular culture tinged with dark humor. Using a distinctive blend of high and low art, Nugroho’s Wayang Bocor is a contemporary form of theater in which puppets and actors weave together traditional elements of Indonesian wayang (shadow puppets) with live theater and scripts that cast a satiric view on contemporary subjects. God Bliss (In the Name of Semelah) tells the story of how Islam came to Java, and became absorbed as a part of Javanese culture that included elements of Hinduism, Buddhism and animism. Street art, comic characters, folk art, traditional culture and video game culture collide to create a multimedia meditation on the issues of everyday life. Simultaneously playful and penetrating, this insightful work cuts across disciplines and cultures. God Bliss (In the Name of Semelah) was commissioned by Asia Society as part of Asia Society’s ongoing initiative Creative Voices of Muslim Asia, supported by the Doris Duke Foundation for Islamic Art. With additional support from Carolina Performing Arts at the University of North Carolina at Chapel Hill. Presented as part of The Public Theater’s Under the Radar Festival. No user commented in " Eko Nugroho and Wayang Bocor "